If you are a fan of aviation and its history, you are about to enter your Nirvana and, ironically, to enjoy Samuel Johnson's dilemma. You have chosen to enter via Peterson Field, Colorado Springs, CO. Spend some time here by clicking any or all of the navigation buttons at the top and right of any page. When you are finished, you may come back here and direct your browser to the other sites tabulated, summarized and linked from the table below. In aggregate, these Registers recorded flight activity around the United States from 1925 to 1942. WHAT AIRFIELDS & REGISTERS CAN BE INVESTIGATED? To-date there are six Registers to explore, including Peterson Field. Please refer to the table below. WHAT WAS PETERSON FIELD? Geographic details and images of Peterson Field are described at the link. The field was located in Colorado Springs, Colorado. The location is now the Peterson Air Force Base. The official Air Force description of the facility is at the link. You can explore the Peterson Field Register using the buttons at the top of this and any other page. At the upper right are the control buttons for the site. Click on each to take you to images of the REGISTER pages, biographies of the PEOPLE who signed the Register, technographies of their AIRPLANES, etc. Across the top of the page are buttons that take you to key REFERENCES that are cited throughout, PRESS COVERAGE, WHAT'S NEW ON THE SITE?, etc. WHAT IS AN AIRFIELD REGISTER? 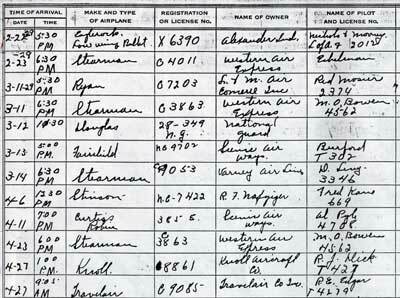 An Airfield Register was most times a large, formatted book in which visiting pilots and passengers wrote their names, the registration numbers of their airplanes, their intended destinations, where they came from, the date and time, and perhaps some remarks. Such books lay open on desks and tables in airport offices and hangars around the United States during the Golden Age of Flight. Indeed, many airports today still have Registers open and available for general aviation pilots and passengers to sign. 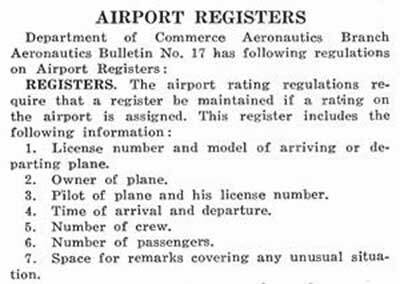 Circa 1926, as part of the effort to regulate the growth of air travel, the federal government issued a guideline to airport managers asking that a log be kept of traffic through their ports. At right is a copy of that guideline. WHAT IS THE PETERSON FIELD REGISTER? The Peterson Field Register is an 11 x 14 inch, two-hole bound book. You may view each of its pages at the REGISTER button at upper right. Its pages were ruled into rows and columns with headers that specified the information for pilots to enter. The surviving Peterson Field Register is 29 pages. The top left quarter of page one of the Register is displayed at left. Use the REGISTER button, top right, to view all of it, as well as the other 28 pages. The Peterson Field Register lay open from February 22, 1929 to August 1, 1940; a total of 4,178 days. It is unknown if other pages existed earlier or later. Across the 29 pages there were 672 landings recorded by hand by the pilots themselves, or, in the case of the uniformly written sample at left, by an operator who signed the Register for the pilots. Regardless, the landings were made by civilian pilots (610), military pilots (55) and female pilots (7). As you work your way through the Register, you may recognize some of their names. Your Webmaster’s copy of the Peterson Field Register was acquired in 2002. Many thanks to C.L. Gundersen for discovering the copy, arranging and sharing the acquisition, and allowing us to learn about the key role Colorado Springs played during the Golden Age of Aviation. WHY BE INTERESTED IN MUSTY, OLD BOOKS? Each Register is a microcosm of Golden Age aviation history, recorded in the first-person, by the very actors who made that history. Study of Golden Age people in aviation points to an aerial “lifeway,” including shared values, clothing styles, politics, interests, vocabulary and perhaps even diet and social skills. That they and their exploits were newsworthy at the time is made abundantly clear by the sheer numbers of newspaper and magazine articles and books published. As an example, in one small study I performed, The New York Times published 1,265 articles about female aviators during that period, an average of three a week. And that is just one newspaper and one small group of aviators. The machines they flew were the best technologies of their time, and they used them in some spectacular, innovative ways. Most of their craft lived hard, short lives. Only a very small percentage exist today, and they and their sister ships are featured on the sites. Whereas the Web is infinitely wide, it is many times only a few centimeters deep. Each Register and its associated Web site gives us an opportunity to dive into a deep, virtual pool of information to enjoy meeting the characters and hardware that shaped aeronautical science through the 20th and into the 21st century. Their influence is palpable today, and will be tomorrow, as we go to Mars and beyond. PLEASE NOTE: As of the upload date of this page, the Web site of the Davis-Monthan Airfield Register has been online eight years, since May 4, 2005. It presents over 1,000 pages of pilot biographies and other topics, which have been added incrementally over the years. The five new sites have less content now, but they will grow over the coming years. Additions and changes to the sites are always posted at the "WHAT'S NEW ON THE SITE?" links on each site. Please bookmark this and the other "What's New...?" pages and come back regularly. All Web pages are designed by your Webmaster and implemented by The Web Professional, Inc., Naples, FL & St. Paul, MN. The contents of all Web sites are wholly owned, researched, written and operated by Delta Mike Airfield, Inc., a 501(c)3 non-profit education company based in Naples, FL. Unless otherwise noted, all designs and original texts and images are Copyright © Delta Mike Airfield, Inc.